Things might be quiet around here for a little while, as we’re pretty busy with BuzzPal and other projects, plus doing some consulting for select pre-funded, seed/angel-funded, and VC-funded founders and web startups. What kinds of consulting and advising? Everything that you see listed in the “Specialties” section of my LinkedIn profile. 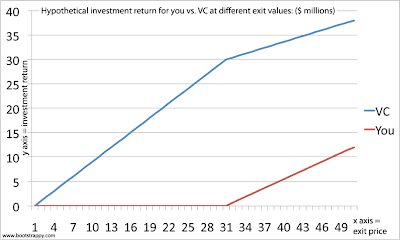 If you’re raising outside investment (angel or VC) and you’re thinking of contacting me, it might be good to do it before the cows leave the barn (i.e., before you get too far down the road, and certainly before you negotiate or sign any investment-related documents). Why? See the “Bootstrap or Die” case study for one example. Debt and equity venture finance, from the late ’90s Internet bubble, through its crash, restructurings, and recovery. Specialist in subscription-based business models (often with advertising and ancillary product/service components). Been through an IPO and sold stock for a decent profit. Been invited to participate in, and cover, various startup and Web 2.0 events around Europe. Founder and seed investor in two seed-stage projects. Assembled an international distributed team of professionals. Started a new blog — Bootstrappy.com — in February 2010. It’s first post made CenterNetworks’ “Weekend Entrepreneurial Reading” list and got over 2000 views in its first week. See my LinkedIn profile and personal blog, pics, and personal Twitter account for more. See here for the TMI version. Y combinator’s annual startup school event was held in Berkeley last Saturday… and Jason Fried of 37signals gave one of the talks which seemed most relevant to European startups. His business partner is actually from Copenhagen and they worked together for two years before meeting in person. Here’s a summary of his presentation and a chat I had with him afterwards. If you are (or are interested in becoming) a startup founder, early team member or investor, check out Yokum's blog. A lot’s been going on over at BuzzPal these past couple of months. Besides design and development work, we’re growing the team, forming a new company, negotiating terms, drafting documents, and generally working through all the administrative stuff you gotta do to get a clean start. One of the questions everybody goes through at this point is: “Who should get how much equity and under what terms and conditions and vesting”? Yokum’s article (below) is about that “vesting” part (other parts to be discussed some below). Yokum suggests standard 4-year vesting with a 1-year cliff, then equal monthly vesting. It’s hard to argue with that. Indeed, it’s what I got at MCG (I got options that where converted to restricted stock before our IPO in 2001) and it’s most people get if and when they get equity.